Not forgetting our popular Karaoke night (Thursday) and Flamingo night (Saturday) in The Stag’s, both with a Refreshers’ twist! These two events are FREE entry as usual, so be sure to get there early to beat the queues. 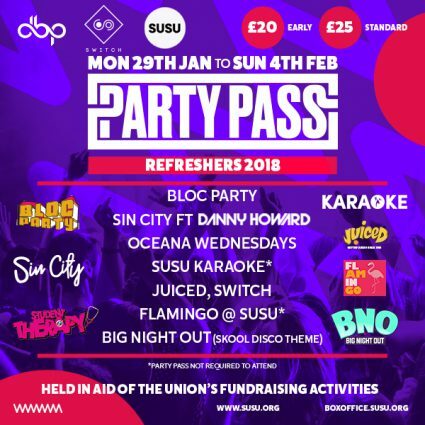 There are a limited number of Early-Bird passes for just £20*, so get yours from the Box Office in Building 42, or online at www.susu.org/boxoffice. Keep an eye on our Facebook page for updates on what to expect and how to collect your Party Pass 2018.